Old gag about how everyone driving faster than you is an idiot and everyone driving slower is a moron. But it's how we think. We believe that our opinions are rational but anyone who holds a different opinion is either ignorant (they don't understand the facts as well as I do) or biased (whereas I am not). This is called naive realism - the seductive idea that we see the world as it is, and not as some subjective picture. Isiah Berlin "Few things have done more harm than the belief on the pert of individuals or groups or tribes or churches, that he or she is in sole possession of the truth, and that those who differ from them are not merely mistaken, but wicked or mad, and need restraining or suppressing." Familiar study where people first asked to put a small sticker in their car window saying "BE A SAFE DRIVER" and then a couple of weeks later asked if they would allow a large sign saying same thing to be placed on their lawn. If hadn't had preliminary experience of small sign request, 17% agreed to have the sign. But if prepared by first request, 88% agreed. Suggest that it was the unusual nature of the request that worked. People have prepared refusal scripts ready for usual requests like for money or time, but are not prepared for something which asks for neither. The 'wisest person in the room pays attention to situational influences. Study where divinity students were sent to a lecture on the Good Samaritan. En route they came across a man slumped in a doorway. Do you think they would stop and help? It depended almost entirely on whether they thought they had been told they had plenty of time to get to the lecture, or if they had been told they were running late. When trying to change people's behaviour, we usually focus on motivation to try to push them towards desired behaviour. But people are already highly motivated to be richer, to not have unplanned babies, or to have a funded retirement. A more fruitful option is to identify and eliminate the obstacles standing in the way of the desired behaviour. Trying to save money? Set up an automatic deduction from wages. Trying to lose weight? Don't shop when hungry, and have a list of healthier things you can cook. If you had to drive your recyclable tins paper and bottles to a depot, it was too much effort, and you were probably just a tree-hugging hippie anyway. But if you provided colour-coded bins to go out with normal roadside collection, it became a public good. Nudges changed the public attitude. Honesty expt where thought they were unsupervised while did series of sums then looked up answers and marked themselves (so apparently could cheat if wanted). They had to sign a declaration of truthfulness, but some had to sign before started, some after finished. Having it at front dramatically decreased cheating. We know that diets don't work, bc body goes into starvation mode where it uses food more efficiently, and programs the body to store more fat when the good times return. So you change your environment - serve food on smaller plates, keep treats like biscuits in colored rather than transparent cases or at back of fridge. Start with small steps rather than procrastinating until the stars align. If want to write a book, start with a goal to write 200 words every day, rather than saying you'll do it when you have 2 week holiday. We attribute way too much to the roles we see people in. So a nurse is seen as a caring person, though she may not be to her family. Soldiers are seen as self-sacrificing, but some of them just enlisted bc there was no other option. We get even more confused buy actors, particularly in TV series that we see repeatedly over time. So Robert Young, star of Marcus Welby MD could promote a medical ad campaign with "I'm not a doctor, but I play one on TV"
It's called FAE - Fundamental Attribution Error. We assume people are poor bc they are stupid and lazy, when in fact just growing up in poverty makes it very difficult to escape the multiple minor crises that richer people can take in their stride. Slave owners looked at blacks as inherently incapable of looking after themselves or as functioning at same intellectual or social level as whites. George Orwell "political language is designed to make lies sound truthful and murder respectable, and to give the appearance of solidity to pure wind." But it's often necessary. FDR got Social Security passed in US in 1935 by describing it as a way for workers to save for retirement. In reality it was straight generational transfer program - taxes on current workers paid for the pensions of the elderly. But Americans deeply allergic to anything they see as socialism, so had to frame it that way. Which of course lead people to believe they werev 'entitled' to govt money bc they'd saved it through their taxes. Game testing co-operation - cash distribution - responses varied depending on whether it was called Community Game or Wall Street Game. The latter conjures up images of dog-eat-dog, and players were more selfish. Unis raise their fees partly bc applicants use that as a gauge of quality. 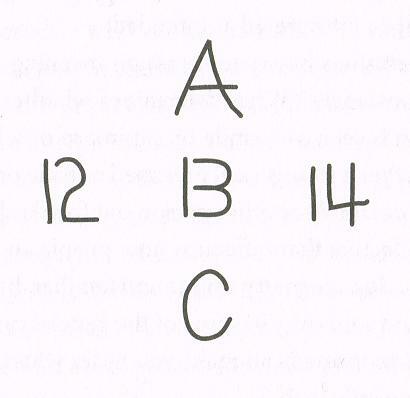 The importance of context: is the center figure a letter or a number? Surest way to spot your own rationalizations is to ask yourself how you'd respond if someone else offered you the same justification. Sane people never act in an evil way unless they can rationalize their actions. The problem is that people are very good at rationalizing. This is particularly noticeable with slavery, apartheid, torture, war crimes and denial of basic human rights. The Holocaust depended on not just the monstrous deeds of a few, but the complicity of the many - those who sold the barbed wire or bought the goods produced by slaves or even just cheered when others cheered or simply remained silent in spite of misgivings. On the other side of the coin, a Holocaust survivor collected stories of people who had helped shelter Jews from the Nazis. Found no common denominator - some were religious, others not. Instead, found creeping charity - agreeing to shelter a child for a night, or give food to a starving family, led to more help later on. We take it for granted that our society is the best, whereas we need to see it as WEIRD: Western, educated, industrialized, rich and democratic, and a lot different to most of the world. Memory doesn't make films, it makes photographs. We remember events by the most exceptional things, and the last thing that happened. We regret cautious inaction rather than impulsive ones. If ask a conservative whether USA would be better if income was distributed in way Sweden does, they would disagree. But if you ask them in a bit of detail, how income should be distributed (how much should top 20% get, how much next 20% etc), you would get a similar picture to Sweden.